Cranberries are some of the most beloved berries. With Cranberry Cream flavored coffee, you can now indulge in your favorite berry flavor with an added mellowness of creamy, sweet undertones. Perfect hot or cold, these 100% pure Arabica beans capture the essence of cranberries and cream with only 2 calories per cup. A heat-sealed valve bag will ensure the freshest coffee experience, and in order to fully indulge in this delicious flavored coffee, we will roast and ship the Cranberry Cream flavored coffee beans on the same day. 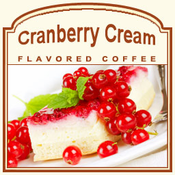 Taste the luxurious Cranberry Cream coffee for yourself, and see what all the fuss is about with this smooth and creamy sweetness.